WELLINGTON, New Zealand (AP) — New Zealanders have begun a final vote on whether to change their flag from a design which features the British Union Jack to one which features a native silver fern. A postal ballot began Thursday and will extend over the next three weeks, with preliminary results to be announced March 24. Organizers say deciding the issue by popular vote represents a world first, and that other countries have changed flags by revolution, decree or legislation. 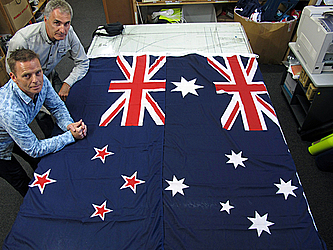 Opinion polls indicate that New Zealand will opt to stick with its current flag, although proponents of the new design say they have momentum and that more and more people are embracing a change. Those favoring change say the current flag is too similar to Australia's and references an outdated colonial past.